You've booked your plane ticket and packed your bags, but how familiar are you with your next sensational vacation destination? Sit back and let us give you the facts about Rame. From downtown Cornwall, you'll need to venture east for 30 miles (48 kilometers) to reach this neighborhood. It'll be a breeze to plan a getaway in Rame with Travelocity. Fantastic savings will be all yours if you score a flight and accommodation deal. And there's more — you can pick from at least 400 partner airlines and 665,000 places to stay. Our Customer 1st Guarantee gives you the security of 24/7 personal assistance on everything from flights and accommodations to activities and rental cars. If you somehow find a better price on another site, we'll refund you the difference^. We all know that sometimes situations change. If you ever wish to alter your travel plans, you will never incur charges from us. And as long as you get in quick, most accommodations won't charge you a fee either^. Unfortunately, you won't find accommodations right in the center of Rame. If you want easy access to this neighborhood, we have 27 lodgings just a short commute away. Book ASAP so you don't get left in the lurch. Compare the offers and then choose between the Crowne Plaza Plymouth (Armada Way) and the Rame Barton (Military Road). They're some of our top recommendations for this area. Where do you fly into for Rame? Ready to begin your next thrilling trip? Well, Rame is about 45 miles (72 kilometers) from Exeter International Airport (EXT). Can I rent a car in Rame? Thinking of taking a road trip while visiting Rame? A rental car will surely come in handy here. Search through the variety of options on Travelocity, pick your favorite and start organizing your road trip playlist! Why bother with a busy city landscape when you can rent a vehicle from a neighborhood outlet? Contact Budget at Sutton Road in Barbican. It's only 0.6 miles (1 kilometer) from the town center. Europcar (38 George Place) is another outlet to try. You'll come across intriguing ideas and excellent artwork at Somerville Gallery. It presents a rotating roster of works that are sure to interest art fans. But that's not all. In the mood for a little fun on the water? Then slather on the sunscreen and dive right into some exciting water sports at Adventure Bay Surf School. Cawsand and Kingsand are well worth visiting while you are in Rame. Cawsand is approximately 0.9 miles (1.4 kilometers) away, while Kingsand is 1 mile (2 kilometers) away. Situated in a rural location, this guesthouse is 1.8 mi (2.8 km) from Somerville Gallery and within 6 mi (10 km) of Whitsand Bay Beach and Mount Edgcumbe House. Mount Edgcumbe House and Country Park and Whitsand Bay are also within 6 mi (10 km). 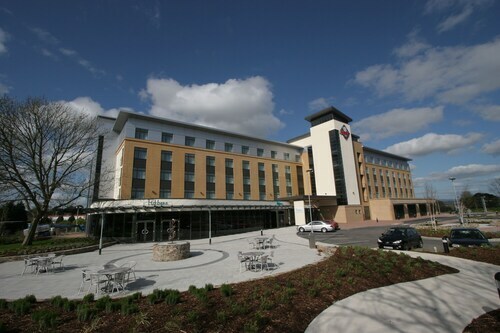 Situated in Plymouth, this hotel is 0.7 mi (1.1 km) from Derriford Hospital and 2.4 mi (3.9 km) from Home Park. Dartmoor and University of Plymouth are also within 6 mi (10 km). 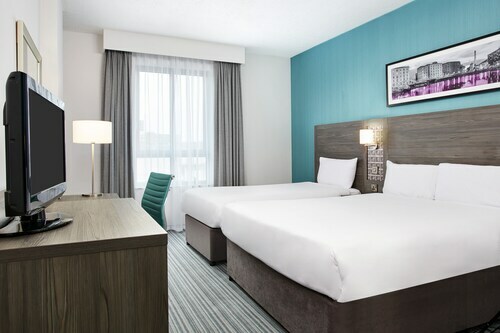 Located in the heart of Plymouth, this eco-friendly hotel is within a 10-minute walk of Charles Church and University of Plymouth. Elizabethan House and Mayflower Steps are also within 15 minutes. Plymouth Station is 14 minutes by foot. 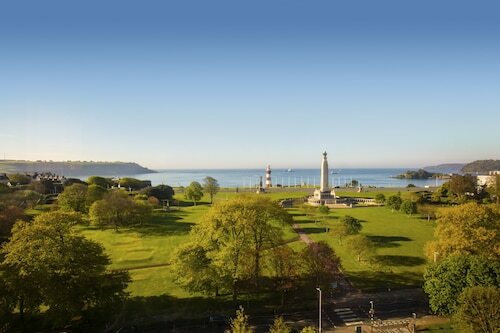 Located in the heart of Plymouth, this eco-friendly hotel is within 1 mi (2 km) of Hoe Park and University of Plymouth. Smeaton's Tower and Plymouth Dome are also within 15 minutes. Plymouth Station is 20 minutes by foot. 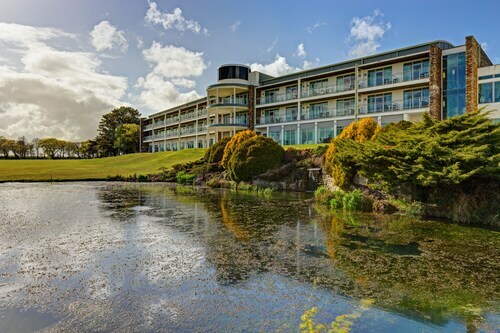 Situated in Plymouth, this hotel is within 1 mi (2 km) of Hoe Park and University of Plymouth. Smeaton's Tower and Elizabethan House are also within 15 minutes. Plymouth Station is 17 minutes by foot. Located in Barbican, this hotel is within a 15-minute walk of Hoe Park and University of Plymouth. Smeaton's Tower and Plymouth Dome are also within 10 minutes. Plymouth Station is 16 minutes by foot. 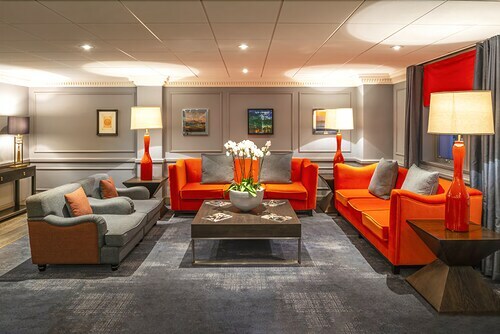 Located in the heart of Plymouth, this hotel is within 1 mi (2 km) of Charles Church and University of Plymouth. Hoe Park and Smeaton's Tower are also within 1 mi (2 km). Plymouth Station is only a 5-minute walk and Devonport Station is 30 minutes. This family-friendly Saltash hotel is located near the airport, 2.7 mi (4.4 km) from Depth Well, and within 6 mi (10 km) of Kit Hill Country Park and Saltash Waterside. Cotehele House and Gardens and Calstock Arts Centre are also within 6 mi (10 km).